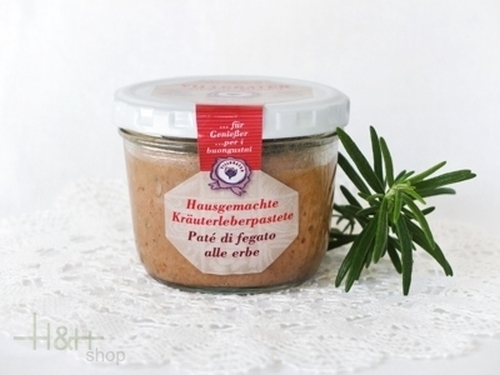 Herbal liver pâté home-made Villgrater 170 gr. The fine herbal liver pâté of the butcher's shop Villgrater, home-made liver pâté with fresh herbs refined, ideally as an occasionally snack, ideally as a bread spread on any bread kinds. Buy now this product together with Smoked Sausages Kaminwurzen Villgrater 3 pieces-app. 230 gr. Smoked Sausages Kaminwurzen Villgrater 3 pieces-app. 230 gr. 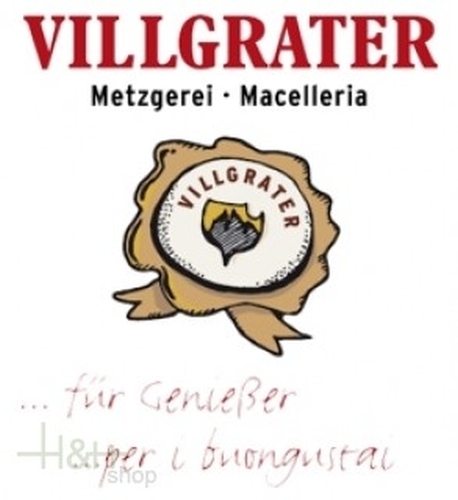 ready for shipment: in stock Smoked Sausages Kaminwurzen Villgrater 3 pieces-app. 230 gr. Buy now this product together with Deer ragout home-made Villgrater 170 gr. Deer ragout home-made Villgrater 170 gr. ready for shipment: in stock Deer ragout home-made Villgrater 170 gr. Deer ragout home-made Villgrater 170 gr. 6,30 EUR / 3,71 €/100 gr. Tyrolean Greaves Lard appr. 200 gr. - À La Carte 3,90 EUR / 1,95 €/100 gr. Herbal liver pâté home-made Villgrater 170 gr. 5,65 EUR / 3,32 €/100 gr. 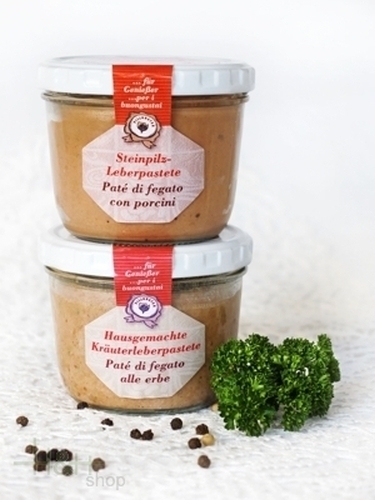 Stone mushroom liver pâté home-baked Villgrater 170 gr. 6,55 EUR / 3,85 €/100 gr. Liver pâté home-made Villgrater 170 gr. 5,15 EUR / 3,03 €/100 gr. Amatriciana sauce home-made Villgrater 170 gr. 4,80 EUR / 2,82 €/100 gr. Ragout Bologneser kind home-made Villgrater 170 gr. 4,95 EUR / 2,91 €/100 gr. Wild hare ragout home-made Villgrater 170 gr. 6,50 EUR / 3,82 €/100 gr. Wild Boar ragout home-made Villgrater 170 gr. 6,35 EUR / 3,74 €/100 gr. Deer ragout home-made Villgrater 170 gr. 6,50 EUR / 3,82 €/100 gr. South Tyrolean Venison Ragout 160 gr. - Alpinatura - Plattner 6,50 EUR / 4,06 €/100 gr. South Tyrolean Beef Ragout 160 gr. - Alpinatura - Plattner 6,50 EUR / 4,06 €/100 gr. South Tyrolean Wild Boar Ragout 160 gr. - Alpinatura - Plattner 6,50 EUR / 4,06 €/100 gr.